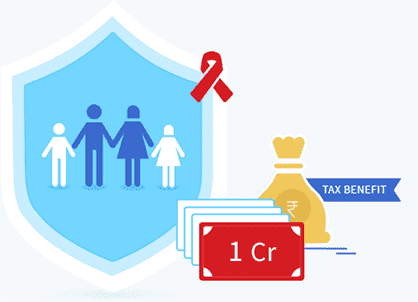 HDFC Life – Guaranteed Savings Plan is a Non-Linked, Non-Participating Endowment Life Insurance Plan which helps you protecting your life goals from eventualities through a life insurance cover and creating a corpus by offering a guaranteed lump sum at maturity. Guaranteed lump sum at maturity: You know the exact amount that you shall get at maturity of the Policy, when you pay all the due premiums. No medical examination: Policy issued on self declaration of good health. No need to undergo medical examination. Tax Benefits u/s 80C & 10(10D) may be available as per the prevailing tax laws. 1Annualised premium shall be the premium payable in a year chosen by the policyholder, excluding the underwriting extra premiums, loadings for modal premiums, taxes and other statutory levies, if any. On survival until the end of the Policy Term, provided all due premiums have been paid, you shall receive ‘Sum Assured on Maturity’ as a lump sum which is based on the Premium Payment Term, Premium frequency and Premium amount. On payment of this benefit the Policy shall terminate and all other benefits shall cease. Waiting Period of 90 days (from the date of inception of the Policy) applies to payment of Death Benefit for reasons other than accidental death. Death Benefit shall be payable as a lump sum as per the following table, provided all due premiums under the policy have been paid until the date of death. 100% of Total Premiums paid. Upon payment of Death Benefit, the Policy shall terminate and no further benefits shall be payable. 5Risk cover starts from date of commencement of policy for all lives including minors. In case of a minor life, the policy will vest in the Life Assured on attainment of age 18 years. What is HDFC Life – Guaranteed Savings Plan? What is the premium payment option? You can just pay once or pay for 5 or 7 years at a frequency of your choice. *Premium amount calculated for a 35 years old male, Sum Assured on Maturity of Rs. 32,650, Premium Payment Term of 5 years, Policy Term of 10 years, monthly premium frequency, exclusive of Applicable Taxes & Other Statutory Levies. Do I need to undergo medical examination? What is the Maturity Benefit? ^Waiting Period is of 90 days (from the date of inception of the Policy) and it applies to payment of Death Benefit for reasons other than accidental death. Death Benefit shall be payable as a lump sum as mentioned above, provided all due premiums under the policy have been paid until the date of death. Is there Policy Loan available? Once a policy has acquired a Surrender Value, loans will be permitted on this product, subject to such terms and conditions as the company may specify from time to time. Please refer the brochure for details.